Kosher consumers are amongst the most inquisitive and educated about the food that they purchase. Most consumers probably pick up their favorite branded items, place them in their shopping cart and don’t think twice. But kosher consumers have been trained to do more. Not only do they look for a reliable kosher symbol, but they may often wonder how an item’s entire production cycle works from a kosher perspective. Take for example a simple bottle of COR certified Heinz ketchup. Obviously the ingredients that make up the product must be kosher, and the factory where the ketchup is produced must be diligently supervised to insure that the dishes are kosher and that there is no issue of steam shared with potentially non-kosher production. What may not be as obvious is that the vinegar and liquid sugar contained in the ketchup were likely transported to the factory in liquid bulk tankers. To ensure that the kashrus of these ingredients is maintained, reputable kashrus agencies require that the delivery of such ingredients to be made in kosher dedicated tankers. This is necessary because it is possible that a previous load of non-kosher product such as animal based oil or glycerin could have been hauled within the past 24 hours. A tanker can become non kosher from holding a cold non-kosher product for 24 hours. This is based on the concept kavush k’mavushal – soaking is like cooking. This causes the non-kosher taste to be absorbed into the entire thickness of the vessel (Shach Y.D. 98:13). Similarly if the non-kosher product was held in the tanker for less that 24 hours, but the tanker was heated, it will render the tanker non kosher. Some liquids are transported hot to enable the product to be pumped into and out of the tanker without being slowed down by excess viscosity. Many sweeteners are too thick at room temperate, as evidenced by the colloquialism ‘slow as molasses’. For short hauls the liquid is heated in the manufacturing plant first, at a temperature higher than that is required, so that by the time it reaches its destination it still maintains the required temperature. This is relevant because this tanker would then be considered a kli sheni (secondary vessel) as opposed to a kli rishon (initial vessel). For longer hauls it is necessary to use heating coils that are embedded between the inner tank and outer shell of the tanker possibly rendering such a tanker a kli rishon. If the current kosher product is heated to yad soledes (the degree of heat from which the hand recoils), it can absorb the flavour of the treif. Likewise if the product in the tanker has a sharp taste, like vinegar, and it is held in the tanker for 24 hours, it will become ossur. Although the non kosher taste is aino ben yomo (isn’t transferred after the vessel has been dormant for 24 hours or more) the sharp taste invigorates the flavor (Y.D. 96). Unless we are certain that the contents of the tanker are 60 times the volume of the walls of the tanker, our vinegar or sugar can become forbidden, even after the fact. To this end COR provides kosher certification for many of these “kosher” tanker companies, who maintain close to 1000 tankers, and various tank wash facilities, in order to maintain the kosher status of any products that require delivery in bulk tanker size. Canada is the world’s second largest country by area spanning over 3.8 million square miles, and manufactured goods are transported across wide distances requiring well developed transportation operations. As Canada’s largest kosher certifier, COR provides a service to kosher consumers by certifying many of these transport companies. Many kosher tankers are maintained by the manufacturers of the ingredients, and are generally dedicated to hauling just one kosher ingredient; others are operated by independent trucking companies, and can haul a host of different food grade products. The independent trucking companies certainly require greater scrutiny. When COR inspects tankers at a company, the process is different from general kosher certification. The inspecting rabbi must rely on reports such as truck logs and wash tickets in order to ascertain kosher status. This is quite different from visiting a manufacturing facility and checking ingredients and product labels. Ensuring ongoing compliance requires careful scrutiny of the various reports and logs and most importantly, engaging in regular audits. Each trucking company keeps proper records at all times. When a tanker goes on a long distance delivery, it is preferable for the company to have arranged the cargo that it will be transporting in its return trip i.e. “backhaul”. The company must be aware which products are approved for the now kosher tanker so that the kosher status is not compromised. The inspecting rabbi does not rely exclusively on truck logs but rather cross references them to the bill of lading which accompanies each haul for more comprehensive load confirmation. Along with unscheduled on site inspections, tanker companies submit log reports on a regular basis to COR and any irregularities are scrutinized. In order to kosher certify a tanker its transport history must first be thoroughly documented. Depending on the cargo transported in the past, the tanker may require a kosher upgrade wash which involves cleaning at a special tanker facility where the tanker undergoes a high heat wash.
A tanker that became treif from holding a cold non-kosher product for 24 hours, or by holding a hot product, must be kashered. Although many tankers have heating coils that are capable of heating the product to yad soledes, heating water to this temperature would not be sufficient for kashering. A proper koshering requires boiling the vessel while it is full with water and having the water overflow. It is difficult to kasher a tanker properly with roschin – boiling water, as the heating coil is not capable of heating the contents to such high temperatures. Rather, this can be accomplished by injecting live steam through inserting a high pressure steam hose into the tanker. It can take 8-12 hours to bring the temperature of a full tanker up to boiling. Many of our companies use this method for initial koshering of tankers that previously hauled non-kosher. Some companies citing safety concerns, the time, or expense involved in such a koshering, requested an alternative. Our poskim (halachic authorities) have formulated an alternative method where the tanker is filled 1/3 and injected with live steam, raising the temperature to boiling. The tanker is then sprayed with 195 F water (irui). This is similar to using a hot stone, to do hagala (boiling water immersion) through irui (pouring). This method (even meluban) is adduced by Rema O.C. 451:6 for koshering large vessels that are difficult to kasher through conventional hagalah. Furthermore, the reason why an irui is considered a lower level of koshering, is because the walls of the vessel cool off the irui water. By pre-heating the walls of the tanker, therefore it upgrades the irui water to the status of hagalah. Ø Tanker should be cleaned and left empty for 24 hours. Ø Tanker should be filled ⅓ with water and, should be brought to a boil of 212 F with live steam injection. Ø While the partially filled tanker is boiling, the tanker should be spray-balled with 195˚F water for five minutes, in the presence of a kosher supervisor. Other kashrus agencies allow an extended irui to accomplish the heating of the tanker and to allow koshering through irui. Since this koshering wash is quite harsh and will eventually reduce the life of the tanker if it is repeated often, it is beneficial and cost effective for the companies to maintain the kosher status of the tanker. Kosher maintenance washes are performed at a lower water temperature and intensity. The cost of these types of washes is therefore also lower. When a tanker only hauls kosher ingredients, it would undergo a regular kosher maintenance wash when required. Tanker wash facilities must also comply with kosher requirements in order to maintain the kosher status of the tankers being cleaned. Only fresh water may be used for pre-washes, rinses, regular washes, and sanitizing of tankers, pumps and hoses. If a wash facility recycles water, it is possible that the facility reuses final rinse water from a non kosher tanker to pre-rinse a kosher tanker. This can compromise the status of the kosher tanker. Additionally when a heat exchanger is used to heat the water for the wash, water passes from the heat exchanger through a hose to the tanker and back to the heat exchanger several times until the desired temperature is reached. If a tanker being washed is not kosher then the water traveling through the system becomes contaminated and will make the entire heat exchanger system not kosher. For these reasons, it becomes necessary to have a kosher tanker wash facility so that kosher designated tankers retain their designation at the end of the wash.
Once a tanker undergoes a wash, the tanker is sealed and is therefore available for its next kosher haul. In addition to the tanker itself, couplings, hoses and pumps must be washed and koshered if required. Tankers that are certified as kosher are recorded in the COR database by their unique tanker number and VIN (vehicle registration number). A letter of kosher certification is generated. 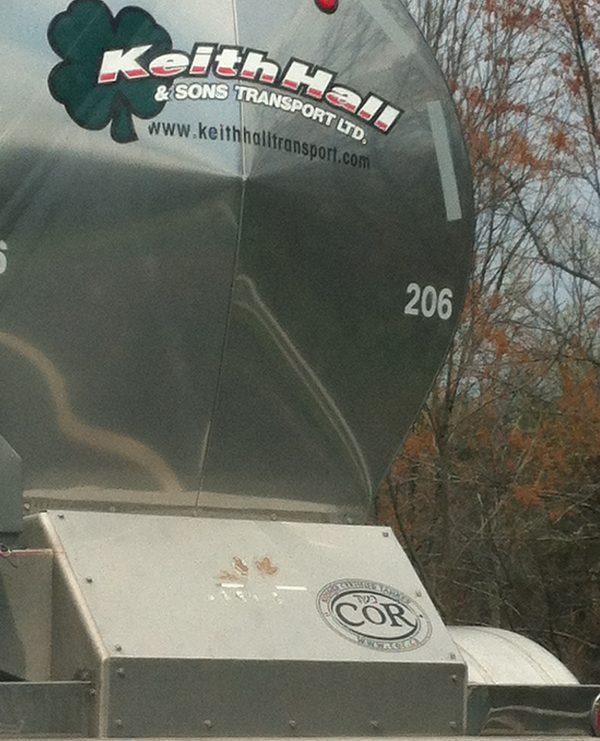 To readily identify these trucks, a COR decal is affixed on the back of the tanker. Loads that require kosher tankers include oils, vinegars, whey, liquid sugars and alcohol. Milk can be hauled in refrigerated tankers that are designated for milk transport only. Glycerin and fatty acids are derived from either animal or vegetable sources and therefore require special attention to make sure that only kosher material is hauled. Pesach introduces yet another complexity. Even kosher certified tankers may have transported chometz. Therefore, careful attention is required to ensure that the tanker has been thoroughly kashered for Pesach under the watch of a rabbi. Next time you travel on a highway behind a food tanker, take a look at the back of the truck and you may see a COR decal affixed. This is a clear sign that the tanker exclusively hauls kosher products and that it is monitored carefully in order to maintain its kosher status. If you have questions about transporting kosher products using kosher certified tankers, please contact the COR at 416 635.9550 ext 263 or info@cor.ca. Logistics Inc LJW Tank Lines Milling Products Ltd.